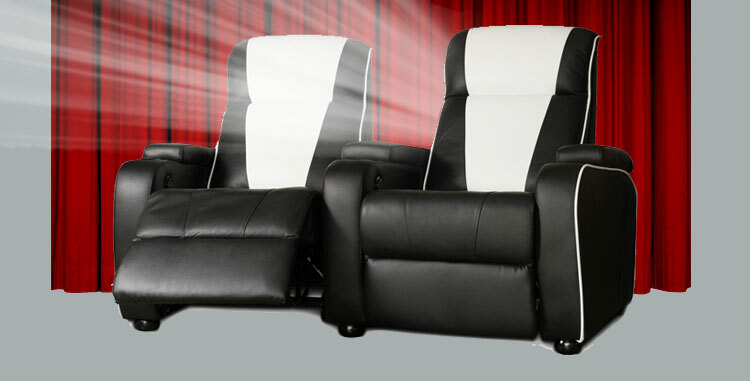 Watching a movie like you never did before, with this amazing lounge chair you transform your room into a home cinema. You don't have to visit a theatre anymore with this automatically adjustable lounge chair. This retro chair matches perfectly with your other Bel Air products. Combine your whole living room, basement, gameroom or any other room with these retro armchairs and some of our other amazing matching products. What about this barcalounger combined with some other cool retro accessories. Herewith we introduce a new range of Metro home cinema seating, beautiful soft leather, electric reclining chairs, with a distinctive fifties American retro look. Available as a single or double seat and in 3 colours: Black/White, Red/White and Turquoise/White. The Metro home theatre chair is made from real soft leather and trimmed with white vinyl piping. It is equipped with an electric motor for easy smooth movement of the backrest and foot rest. Each arm is fitted with a useful, sufficiently deep, cup holder, which can de removed for cleaning. The Metro movie lounge chair is fully fire retardant and CE approved. This barcalounger fits perfect in your gamer or livingroom, with it's cool colours and nice leather you can complete your furniture and make it a cool retro room.